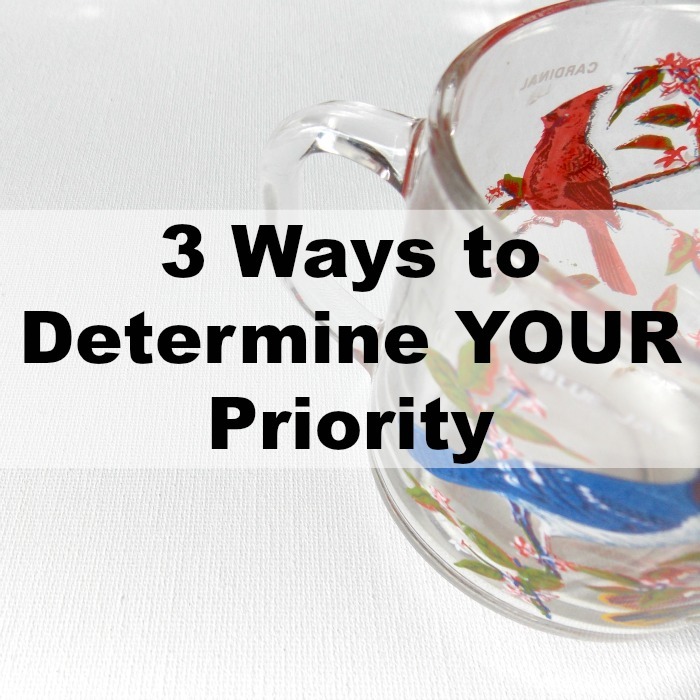 Determining our priority can be difficult. Most of us try to juggle many responsibilities in a day and urgency usually gets first place. We may not always know what our top priority is because we're so busy stomping out fires from urgent needs. 1. What is most valuable to me? I heard Chalene Johnson once ask, "What would you be devastated without if it was gone tomorrow?" Career? Relationship? Family? Faith? Finances? Pet? Determine what this is and you will have the key to setting boundaries and deciding what you let into your life. Your priority may change, or it may be one constant value in your life. Whatever it is, keep this in the forefront of your mind with each decision you make. When my kids were smaller and needing me more often, I had to make the decision to cut some activities from my days so I could spend time with them. My kids are older now and not in need of being physically cared for like they once were; so my season has changed. I'm needed now for emotional support more than physical so that changes my priorities. Since my kids are not home in the daytime, I can teach and pursue other interests. But in the evening, I make it a priority to be home for talking and/or engagement. Building relationship with them is very important to me. 2. What are you skilled at or enjoy doing? This is where your gifts come in. What do you naturally gravitate to? What do other people tell you you're good at? Take notice, get real close to what you do and why. What is it exactly that you love about that thing? I found that meeting with friends one-on-one is my favorite way to connect. I don't really like parties or getting together with large groups. When I prodded myself to understand why, I realized it's because I love talking intimately and really connecting on a deeper level. But that rarely happens with a large group. In a large group there is much more small talk and catching up for fun and while I enjoy that for awhile, as an introvert, it's exhausting. Just understanding this about myself helps me choose which activities I'll be involved in. Less parties, more one-on-ones. 3. What are you obsessed with or learning? Think about what you're learning right now. Think about why you're learning it. Is it just for enjoyment? Then it might reveal a passion you have. Is it to solve a problem? Is it because you love learning? Evaluating what you're learning right now and why you're learning it, will help you determine that priority. If you're pursuing something or wanting to pursue something, it should be a priority for you. You may find one common thread answering all three questions or you may have different answers for each one. If you have three different answers, is there a way to combine them? If not, try to evaluate which one should take the lead and continue to pursue that first. Work on the other two each day as well, even if it's just fifteen minutes. I'll give you an example in my own life. My answers are: family, connecting one-on-one and painting/writing. Since these are my priorities, I try to be available to my husband and kids as much as possible and really listen to them (looking in the eyes, putting my phone away, stopping what I'm doing). I'm also pursuing friendships one-on-one in coffee shops but also on Periscope (a live-streaming app). Since I have more free time in the day, I've been pursuing my long-time passions of writing and painting on the days I'm not substitute teaching at my kids' school. These things work together for me because of the time they happen during the day. When I'm pursuing my passions and Periscoping, my husband and kids are in school, at work, studying or otherwise occupied. When they're home, I'm enjoying them. These three categories satiate my need for community and learning. What are your priorities are in this season?